A GSM network consist of various functional entities. Those functional entities functions and interface are specified. Figure shows the generic architecture of a GSM network. First of all you should know the full meaning of GSM. A GSM architecture consists of three major subsystems that interact between themselves with the users through some network interfaces. Notes : You can check more basic information about that then check the link in the end of this post. The MS full form is Mobile station is also a subsystem. but it is considered to be part of BSS for architecture purposes. The BSS called as the radio subsystem provides and manages the radio transmission path between the mobile stations and the mobile switching centre. It also manages radio interface between mobile stations and other subsystems of GSM. 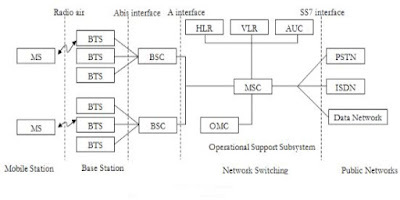 Each BSS comprises many base station controllers that connect the mobile station to the network and switching subsystem through the mobile switching center. 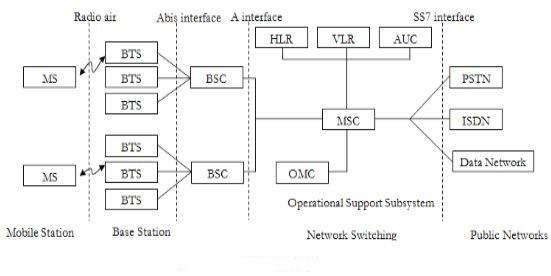 The NSS controls the switching function of the GSM system. It allows the mobile switching center to communicate with networks like PSTN full form, ISDN, CSPDN, PSPDN and other data networks. The operation support system ( OSS ) allows the operation and maintenance of the GSM system. It allows the system engineers to diagnose troubleshoot and observe the parameters of the GSM system. The OSS subsystems interact with the other subsystems and is provides for the GSM operating company staff that service facilities for the network.